I remember that it was a spring day, back in 2006. I had left Woolpit, and was cycling out into the hills. Woolpit is a good village, with pubs and shops and fine old houses, as well as one of Suffolk's most interesting churches, despite its faintly ridiculous 19th century steeple. The village is smaller than you'd expect from its centre, and soon I was threading through narrow lanes that dog-legged and climbed beside open fields. Not long after leaving the houses behind I entered Drinkstone parish, and here side by side were two windmills, both now without sails but majestic still in the early spring sunshine. They are particularly interesting because the 16th Century post mill is the oldest in Suffolk. The smock mill beside it is not much younger, although it has been successively rebuilt over the years. Both were still in use into the 20th Century. I came down the hill into the village of Drinkstone. 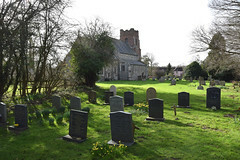 This is the smaller of the two villages in the parish, and it is the one where the church is, the settlement known as Drinkstone Green being about a mile to the south. The infant River Blackbourn runs alongside the village street, and you cross it and climb up to All Saints. The setting is lovely. The church sits above the road on a soft cushion of green, the old school beside it. 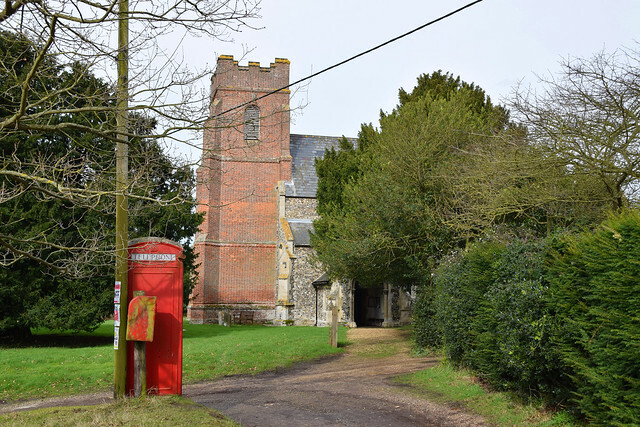 Coming back in 2017 I approached from the other direction, past a red phone box standing as proudly as the red-brick tower of the church. It might surprise you learn that the tower is neither medieval or Victorian. 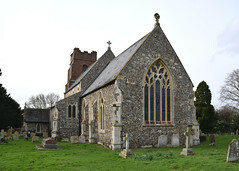 It was one of the earliest Suffolk towers built specifically to accomodate recreational bell-ringing, dating as it does from the last years of the 17th century, when this sport was beginning to take off. We know it was built at the behest of the Rector Thomas Cambourne, who also paid for the bells. A plaque remembering this is set in the west wall of the tower. It is interesting to compare Drinkstone's tower with earlier Tudor red-brick towers like Hemley and Charsfield, and later 18th century ones ones like Grundisburgh and Cowlinge. It has more in common with the former than the latter, except that here there are classical louvred arches, perfectly designed for the bells to sound out from. 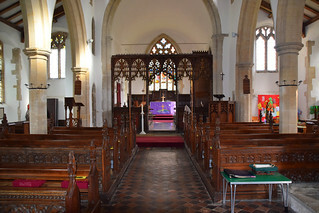 If it looks more medieval than it is then it may be because of the lancet in the base stage, part of an 1860s upgrading by Edward Hakewill, whose trademark, a quatrefoil clerestory, is also in evidence above the aisles, looking very like the same thing at his Thurston acoss the A14. He appears to have raised the nave roof, or at least the angle at which it cuts into the tower, because this now looks rather awkward. 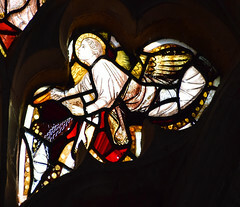 If so, the east wall of the nave must also be his. 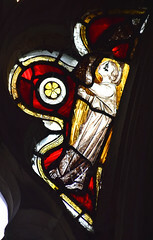 The tracery in the east window certainly is, and that whole face of the chancel has been rebuilt. 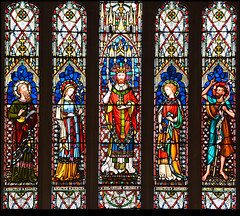 The 1860s glass in the east window is by Lavers & Barraud. I find it hard to warm to Hakewill's work; his introduction of high gloom into the churches he restored seems intentional, and is often coupled with low aisles that only increase the austerity. Luckily, the great aisles here make the nave as wide as it is long, and you step in to a feeling of lightness. The great tower arch contains a modern ringing chamber in light wood, which looks splendid, and suggests that Cambourne's work is still very much appreciated. 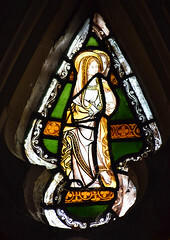 One of the best things about this church is its scattering of 14th and 15th Century glass, Some of which is unusual, but all of it quite heavily restored. 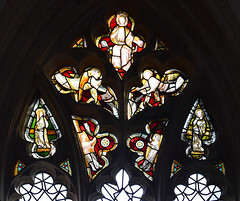 In the upper lights of the south chancel window are angels of the Precious Blood swinging censers. 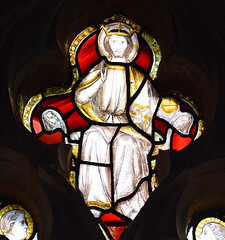 Christ in Majesty is at the top, and the two figures either side are two Marys and St John, reset here from a rood group. 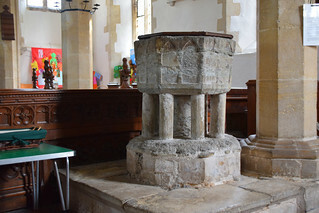 The font is set against a pillar in the south arcade in the traditional manner, and is one of those arcaded octagonal fonts you find mainly in the east of the county, usually made from Purbeck marble. Or, at least, it appears to be, but I couldn't help wondering if it was actually an older, square font that had been cut down and decorated by someone locally. It just doesn't have the same finish as other fonts in this style. 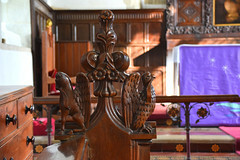 The benches are Victorian, and there are some hefty bench end carvings. Mortlock thought they might be from the studio of the great Ipswich woodcarver Henry Ringham, whose work is much in evidence up the road in Woolpit, but I wasn't so sure. They don't seem to me to be of the usual delicacy of his work. The dove with an olive branch, for example, looks more like a chicken. 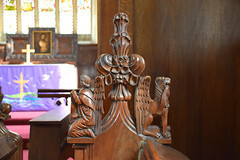 There are also a couple of medieval bench ends at the back, and they repay more than a passing glance. 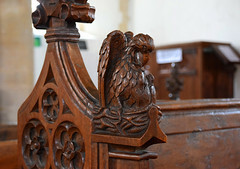 Although the bench ends are very bady damaged, they both have carvings on them. 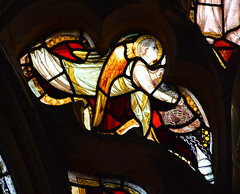 One is an angel who has had his front neatly sliced off, presumably by an iconoclast to eradicate the design on his shield, while the other is a version of the carving at Blythburgh which is often refered to as 'scandal' - a face carved into the poppyhead with an outstretched tongue.There is another near here at Bradfield St George. 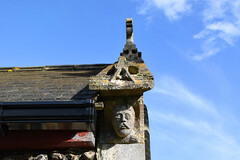 This version is rather more elaborate than those two, because there are two further heads sticking out their tongues to left and right beneath the top head, and they have not been vandalised like he has. Despite being repainted, the roodscreen is beautiful, the upper tracery boiling like lace into the air. The roodloft stairway set in the north wall beside it is one of the most complete in Suffolk, retaining all its original steps and even the handrail. There is a very curious stone platform stretching west of here. 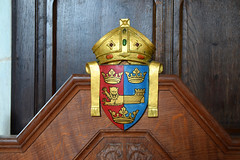 Today it is used for the lectern, but it may have been part of a tombchest originally, or even what Mortlock calls a preaching platform. It is certainly very unusual. The drop-sill sedilia in the sanctuary has lost its arching, but the wooden panelling set into the back of it is medieval. Perhaps it came from the roodloft here. It was probably set there during the 19th century restoration, and may have come from anywhere originally, I suppose. The family at Drinkstone Hall for many years were the Grigbys, and they've left their mark here. Two matching, elegant 18th century memorials with urns on flank the vestry door, with a simpler one above. 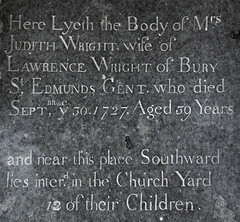 But more interesting are two memorials in the nave. 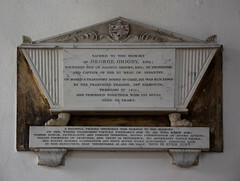 Thomas Grigby was killed in the Peninsula war of 1811 - on board a transport bound for Cadiz, he was run down by the Franchise frigate off Falmouth and perished together with 233 souls. Almost forty years later, during the Indian Mutiny, fourth son of the Rector John Peloquin Cosserat was shot in the mouth by a musket ball while commanding his regiment the first Punjaub Cavalry against the rebels at Koorsee, an incident which seems to have stepped out of the pages of The Siege of Krishnapur. As you can see, All Saints is full of interest. It doesn't wear its heart on its sleeve, and there must be very few of the many hundreds who visit Woolpit every year who ever make it down the road to here. I wandered around the graveyard in the sunshine. Although the area to the west of the tower has been partly cleared, the rest is fun to explore, with lots of 19th century graves and even some 18th century survivals. The massive yew tree by the south porch must have seen a fair few funeral processions in its time. I wandered further eastwards, and, as I approached it, one of the largest cats I've ever seen bestirred itself lazily from the long grass and wandered off. I guess there must be rich pickings for a hunting cat in a place like this. 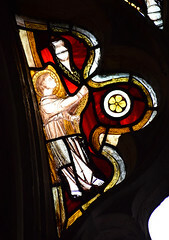 And there are riches for church explorers in this area, many of them as little known as Drinkstone. 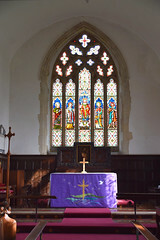 The next parishes in each direction are Gedding, Rattlesden, and the wonderful Hessett, all worth an hour of your time, all as open and welcoming as this one.